If you want to create an optimal indoors temperature while also saving up on energy costs, then attic insulation is for you. Find out more about the available insulation services. When was the last time you've been in your attic? This is a very important question as mold, rodents, and an impressive layer of dust could be taking over it right now (all together!). While in reality it may not be as dramatic, it is true that most homeowners have no idea whatsoever about the state in which their attic is. That is why it's important to perform regular attic cleaning sessions and in order to prevent any dust accumulation or harmful infestations, opt for high-quality insulation installation. The insulation in your attic serves an important function by helping to keep the temperature in your home optimal. It prohibits any heat escapes and by these means, ensures your HVAC system inputs a lot less energy while working. However, if the insulation has been damaged from water, pests, or any other factors, it's most likely not fulfilling its protective role as it should. This can mean cold spots, and a rising energy bill if left unchecked, but thankfully it can easily be fixed with professional help. Your insulation may simply need some fresh, additional padding to help it keep up or it might need a full-on removal service in order to install new and more efficient materials instead. Or otherwise, it might be your first encounter with insulation, case in which it is a great investment for your home's well-being and energy-saving efforts. If energy saving efforts is one of the main reasons you are opting for insulation services, then you can step-up your game even further. Our team of professionals can install a radiant barrier or attic air sealing as well. Radiant barriers reflect sunrays back, which naturally helps keep your house cooler in the summer without having to run the air conditioner as much. 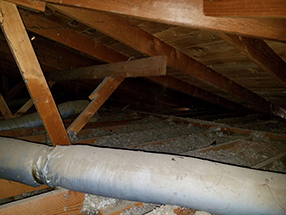 Attic air sealing is another layer of protection against any air escaping your home, so that it can circulate freely and keep a steady temperature. By upgrading to these insulation measures, you will be able to save a lot on your energy bill while also becoming more eco-friendly. If you are running any commercial business where you have to interact with customers, ensuring an optimal and cozy atmosphere is crucial to success; not to mention the massive savings you will achieve when it comes to your energy bills. On the same note, comfortable employees means a better workflow! Make sure your employees are not slowed down by fluctuating temperatures and confirm that your building's insulation is working as it should be. Our team will take care of any issues when it comes to removing, placing or re-applying insulation. It's time to take the first step to saving your home or business on high energy costs and to ensure comfortable temperatures as well. Call Air Duct Cleaning Oakland today.